The Board of Governors recently recognized Associate Provost for Scientific Training, Workforce Development and Diversity and Graduate School Dean Ambika Mathur, who has accepted a new position as vice provost for graduate studies and dean of the Graduate School at the University of Texas. 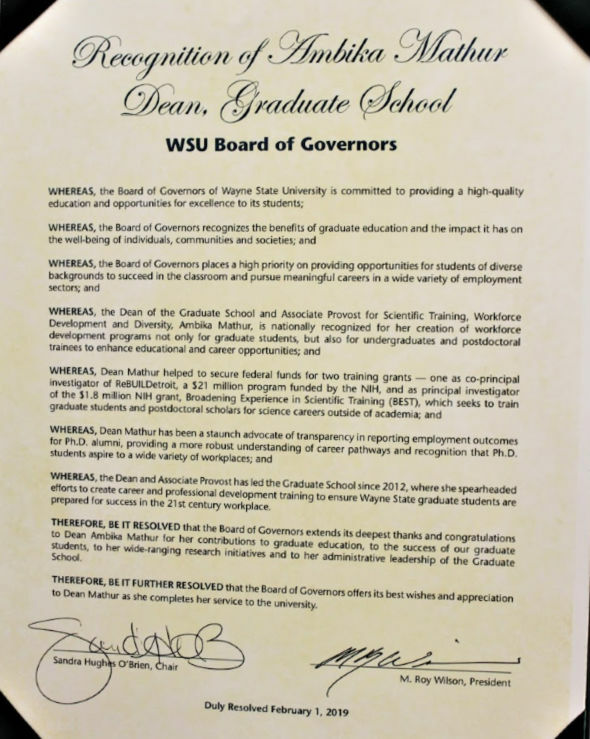 The board issued a formal resolution lauding her contributions to Wayne State during its Feb. 1 meeting. Among the accomplishments noted is Mathur’s national recognition for creation of workforce development programs to enhance educational and career opportunities for graduate students, undergraduate and postdoctoral trainees. Named associate provost in 2016, the resolution also notes her work to empower students who are underrepresented in their disciplines through programs such as the Postdoctoral to Faculty Transition Program (PFT), which prepares early career scientists for tenure-track faculty positions at Wayne State. The resolution also notes Mathur’s success in securing two large federally funded training grants. She served as co-principal investigator of ReBUILDetroit, a $21 million program funded by the National Institutes of Health to prepare students from diverse backgrounds for careers in research. She also was the principal investigator of the $1.8 million NIH grant, Broadening Experience in Scientific Training (BEST), which seeks to train graduate students and postdoctoral scholars for science careers outside of academia. 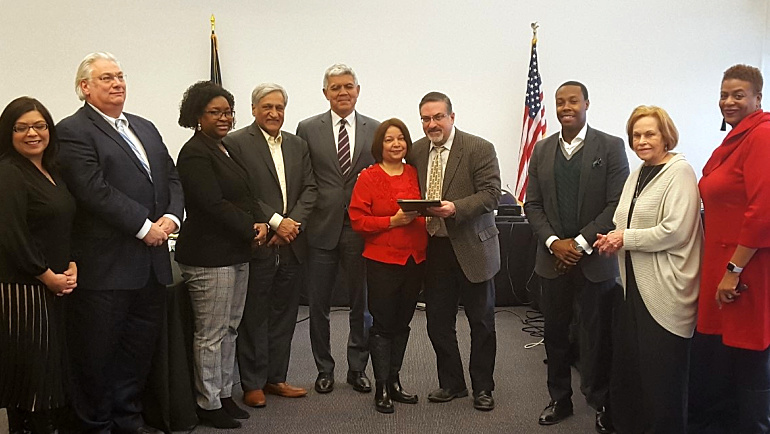 A staunch advocate of transparency in reporting employment outcomes for Ph.D. alumni, the resolution commends Mathur’s ambitious data collection efforts to determine 15-year career trajectories for 3,000 Wayne State doctoral alumni. This data has led to a more robust understanding of career pathways and a recognition that Ph.D. students aspire to a wide variety of workplaces. Mathur, who joined Wayne State in 2003, has led the Graduate School since 2012. As dean, she also spearheaded efforts to create career and professional development training through a competency-based micro-credentialing program to ensure Wayne State students are prepared for success in the 21st century workplace. Another key initiative was the use of holistic admissions for applicants to doctoral programs who may not be admitted based on standardized test scores but have demonstrated grit and persistence. In addition, Mathur was the first permanent director of the university’s combined MD/PhD program and the founding director of the Office of Postdoctoral Affairs. Following presentation of the resolution, three trainees from programs led by Mathur were asked by O’Brien to share their experiences. All three said the programs have transformed their careers, and they thanked Mathur for her mentorship. They were Sara Elhasan (ReBUILDetroit scholar), Jennifer M. Gómez (PFT fellow) and Nisansala Muthunayake (former graduate research assistant BEST program and postdoctoral fellow).